This tutorial was published on my regular blog some years ago. 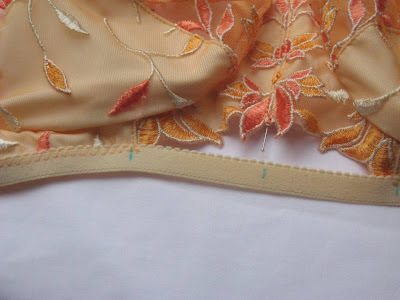 It's not about constructing the complete bra, but only describes the construction of the center front/bridge when you want to make it with lace as in the photo below and the inspiration from rtw above. 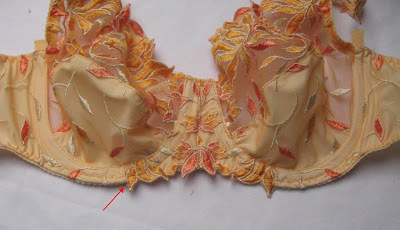 There is a seam at center front, add a seam allowance to the pattern piece if necessary! Cut the centerfront with the bottom edge on the scallop (deepest point of it). Don't use seam allowances there. 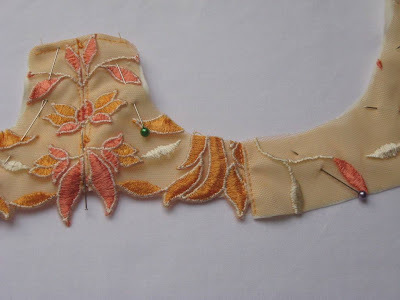 Sew the center front as you do normally (with non stretch interfacing) and attach it to the side/back panel. 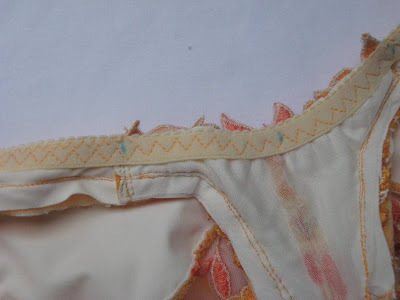 Cut the elastic in the length you need and mark center front and the points to match the seam under the cup (in this way of working you have to measure your elastic, for me that is lengt of band minus 20%). I've marked with disappearing ink, you can also use pins. Stitch the elastic with a small zigzag stitch to the bottom of the band, do NOT stitch the center front. 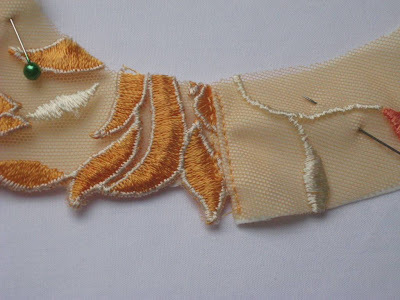 Fold the elastic to the inside and topstitch with a triple zigzag. In this way the center front of the elastic is held in place.